Firepro Systems is happy to announce that after many years of R & D the successful completion of the development of a system for protecting buses, heavy goods and commercial vehicles, vans and private cars in the event of fire.The work was witnessed by RINA – Italian Marine Registry (Fire protection & Life Saving Appliances Section) and Hughes Associates Europe srl, which prepared a Peer Review, and endorsed the Firepro Vehicle Fire Suppression System. The system automatically detects fire, and notifies the driver for activation by visual and audible alarms. Optionally an external beacon of high sound intensity may be fitted.Upon activation, the generators release a fire suppression condensed aerosol which extinguishes fire by inhibiting the chemical chain reactions of combustion. The aerosol will not damage any engine components and is not toxic.The installation is very easy, and maintenance free; no need for pressure gauges, or weighing generators (unlike conventional fire extinguishers), and only monthly visual checks. 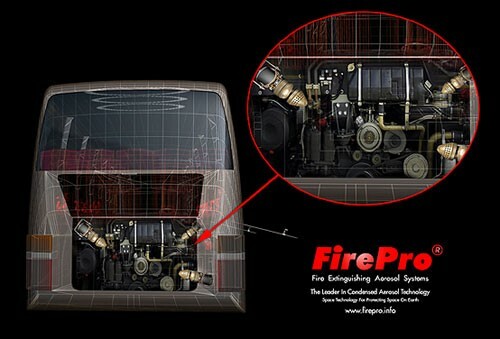 Unlike conventional fire extinguishers, using the Firepro Vehicle Suppression System will save considerable and valuable time in combating the fire, and offer more time and safety to the passengers for evacuating the vehicle. In addition, the system is more effective and efficient in extinguishing the fire, and offers more protection in preventing unnecessary damage to the engine compartment, and to the vehicle as a whole. There is a tremendous incentive for protecting buses, heavy goods and commercial vehicles, as well as vans and private cars, especially as this is stipulated by law in many countries.